I’m building a pergola out of rough sawn red cedar. 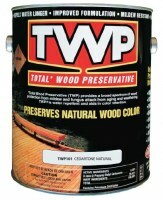 Can I let the lumber dry out in my garage and then apply TWP 100 or 1500? If rough sawn, then yes. I had a carport installed last week. The posts are treated wood and the top is cedar. 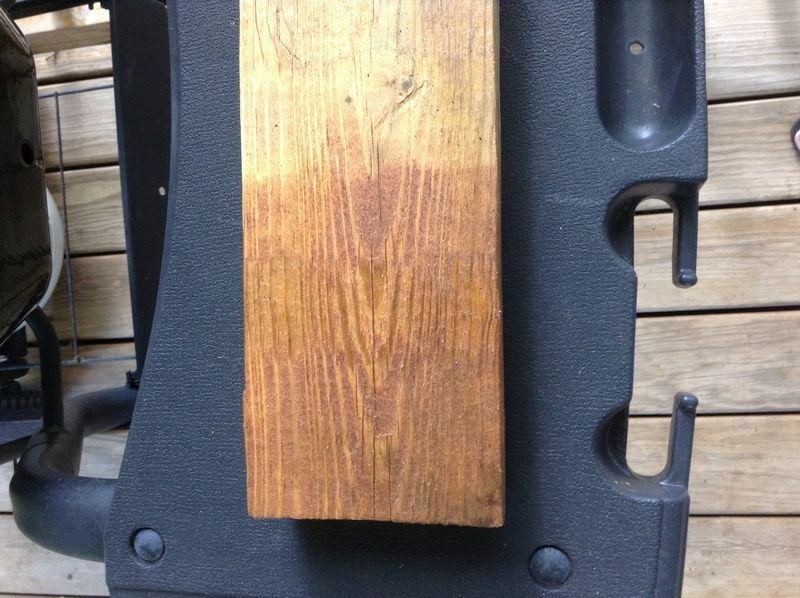 What stain color would you recommend using on the treated wood and cedar for it to look more uniform? Nancy, I just finished staining my cedar porch that looks identical to yours. I used 100 series dark oak and clear. I mixed it 2:1 (2 gallons of dark oak and 1 gallon of clear). I did this to help lighten up the dark oak. On the cedar, dark oak is pretty dark. We wanted dark but not that dark. It mixed perfectly. Took right at 5 gallons to do all of this. Turned out great. We have pine on the ceiling so it gave it a good two tone look. Hope this helps! Here are the before and after pictures. Thanks for sharing this information with me, Jordan. It was really helpful! Nancy, I just had my house done similar to how you did your carport. 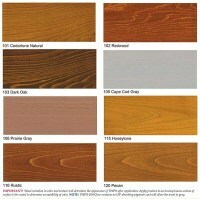 I have tried several samples and I think we are going to mix clear and dark oak. We want a lighter brown color but dark oak is very dark. We plan on doing ours next week. I’ll post when we finish and what we used. I have some leftover TWP 100 from staining my porch. Can I use it on a picnic table or is it inappropriate for an eating surface? As long as you prep the picnic table correctly, you are okay. Make sure to allow the TWP to fully cure before using. Is there an advantage to using twp 100 over TWP 1500 if your state allows it? I will be staining a new wood deck about 12 months after it was constructed. No advantage. They will both last about the same. I am absolutely not allowed to apply anything on or even near the water. No mitigation is acceptable. I will have to remove the deck transport it off the water and stain it there. A lot of extra work. Do you recommend staining all sides or just the top? I am getting ready to install 2x6 KDAT decking on a dock. I would like to stain all sides of the boards but this will have to be done before installation. I would not be able to wait the recommended 2 months. I am not allowed to apply stain on the boards if they are on the floating dock per lake regulation. What is my next best option? You cannot do it now as it needs to weather. Install, let weather, prep, and stain. You can either remove from water to stain or use something to catch the stain drips from getting into the water. 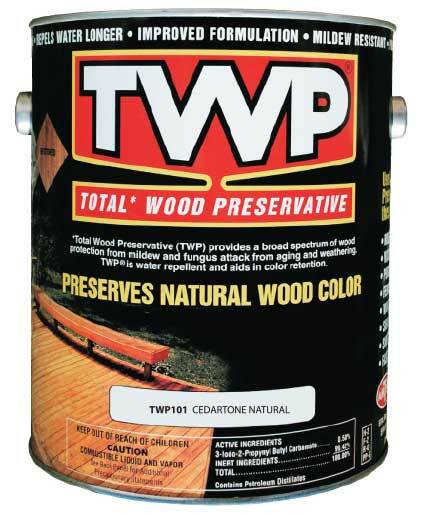 What would be the coverage per gallow for TWP100 on Preasure Treated Pine that has been left to dry out for a year? Would I get closer to 100 sqft per gallon or closer to the 200 sqft per gallon? My get is 630 sqft. Thanks! You will need about 5-6 gallons for the 630 sq feet and the two coats applied wet on wet. As long as the wood is prepped correctly. Will TWP 100 Prairie Gray work on chairs made out of pine? Thanks!! 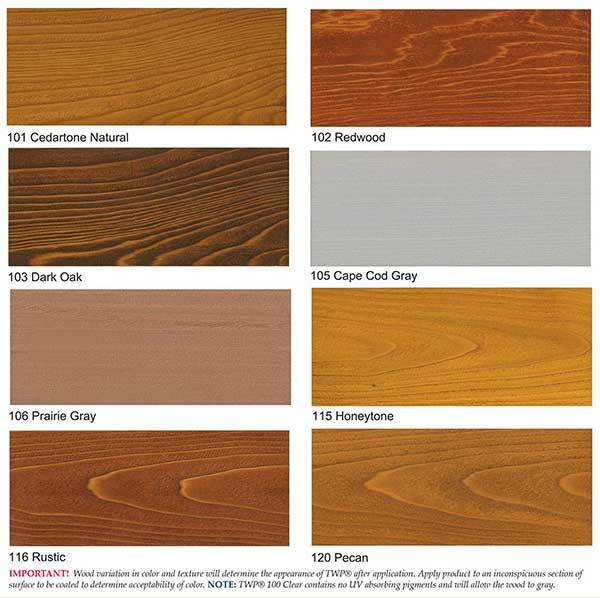 Is cedartone and cedartone natural the same color? 12-24 hours after applying should be okay for a rain. I applied the TWP 100 yesterday and thankfully 12 hours later--no rain. 12-48 hours. Make sure it is dry and not sticky or tacky. My neighbor decided to run his sprinklers and soak my fence just hours after staining....is there anything that can be done? 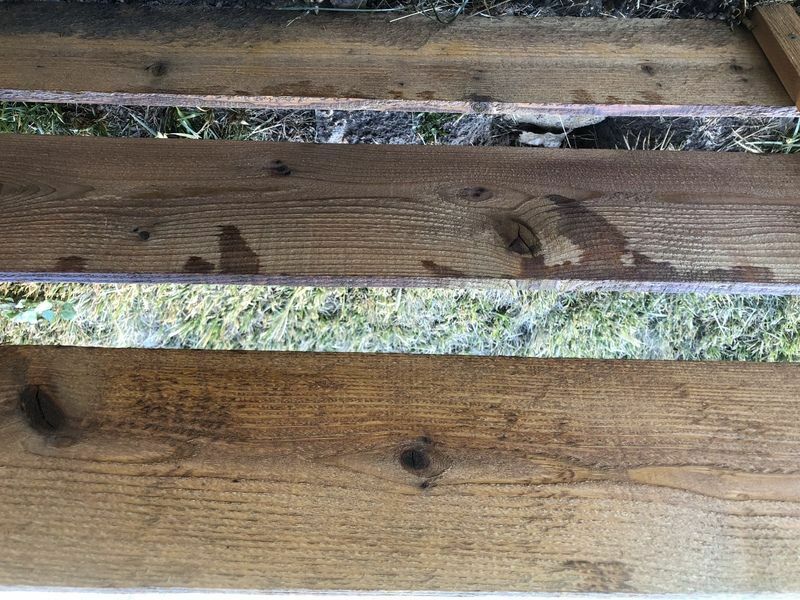 What happens when the fence gets wet after staining? Hard to say if affected or not but most likely fine. It would very noticeable if it is an issue with stain drips and runs. :( now that its daylight I can see the damage. Only dripping in 6-7 areas on 1 side of the fence. Anything I can do to soften the spots up without redoing the whole thing? FYI, that is not from the sprinklers but bleed through from the opposite side. Try just touching up those 7 boards by lightly recoating them. Make sure do the entire board length end to end. Click the stain color options in the drop-down above the add to cart. I had a new PTP deck installed approx. 7 months ago. Approx. one month ago two boards were sanded down level with the other boards bc they had warped/risen up higher than the other boards on deck. I live in the NC mountains w/lots of shade, rain and prone to mold/mildew. How long should I wait for those two boards to weather before I stain, and do you recommend TWP 100 or 1500? Also, do you think Gemini deck cleaner/brightener kit will remove the wood stamps? 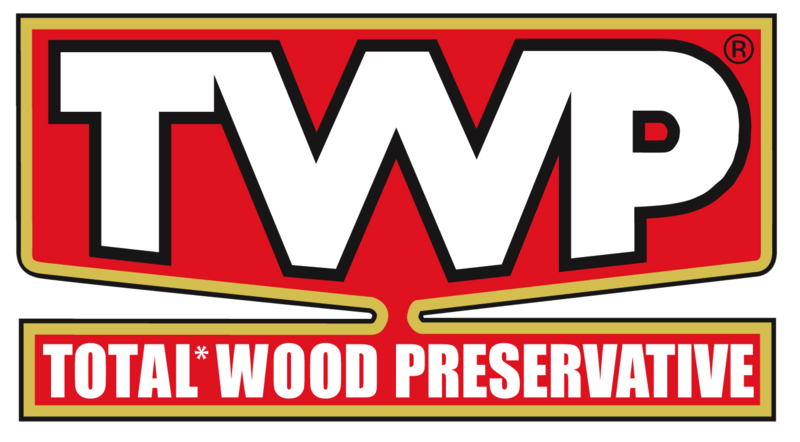 Use the TWP 100 Series. The prep kit will not remove the stamps. You will have to sand them off now. 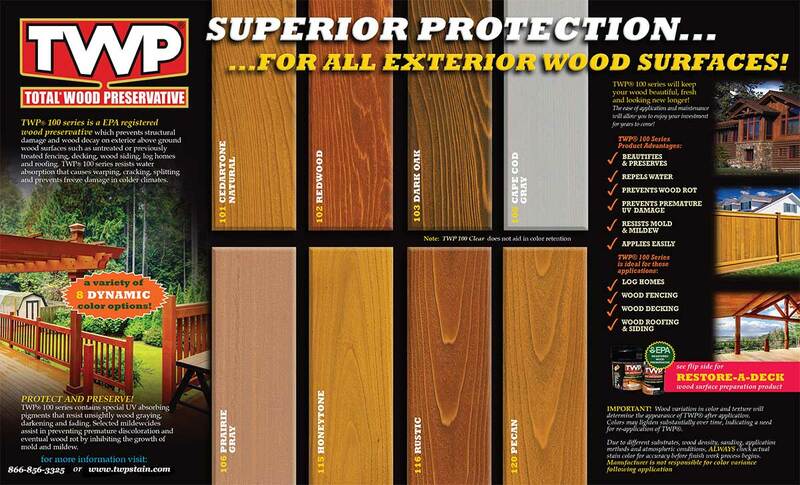 Let all wood weather for 1-2 months after you sand and then proceed with the prep and stain. It will depend on the type of wood you are applying the Cape Cod gray on as to the amount of wood grain/knots that will show through. 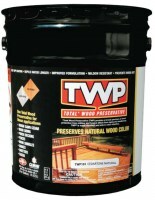 I live in SC and applied it to "new" one year old weathered pressure treated lumber. 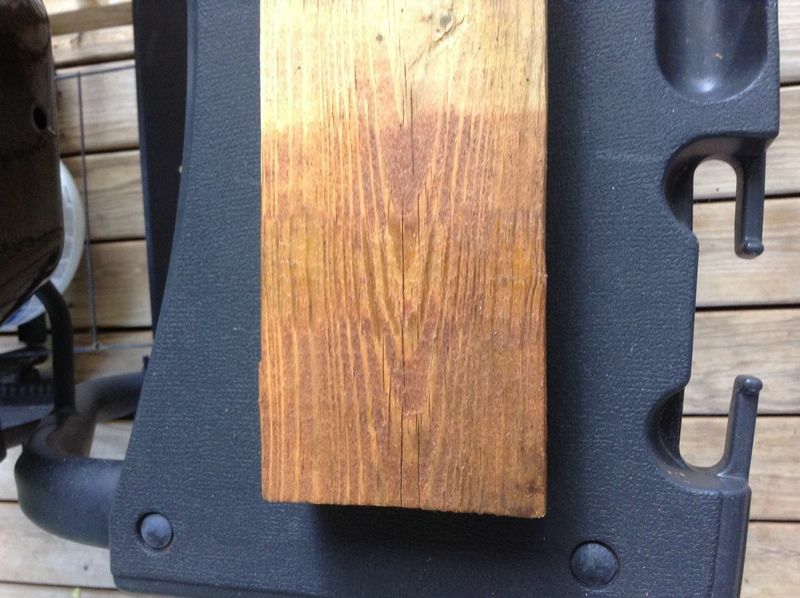 I ordered a sample of the color and it appeared more solid on the sample I received than on my dock wood. Some areas of my wood are more solid color and some show the grain and knots through this stain. It has only been applied about 2 months, so I can't attest to how well it will weather, but it certainly repels water. GOOD LUCK! You will have to strip off the Thompsons first. No point in using a clear sealer. Okay so you would need a product to recoat even if it's the same color? Are the semi solid colors still oil based? What is the expected typical longevity of those coatings? You always gave to prep when recoating. Yes they are oil based. 2-3 years. The gray is not a solid color but a semi-solid. 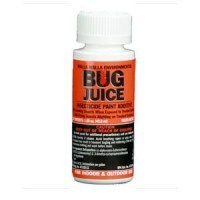 You can clean and reapply as needed. It does not peel. Thank you. So what is the process to reapply the same grey color? Also, if I decided I wanted a differentStain color later what is the process to prepare for a differentcolor stain? 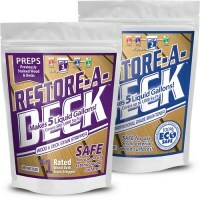 To recoat with the gray, use the Gemini Restore Kit. 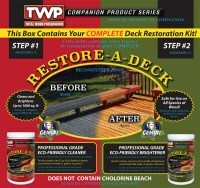 If you want to switch colors, use the Restore A Deck Stripper and Brightener Kits. TWP is awesome! Love the way it looks on my 2 years old deck. Could not be happier. 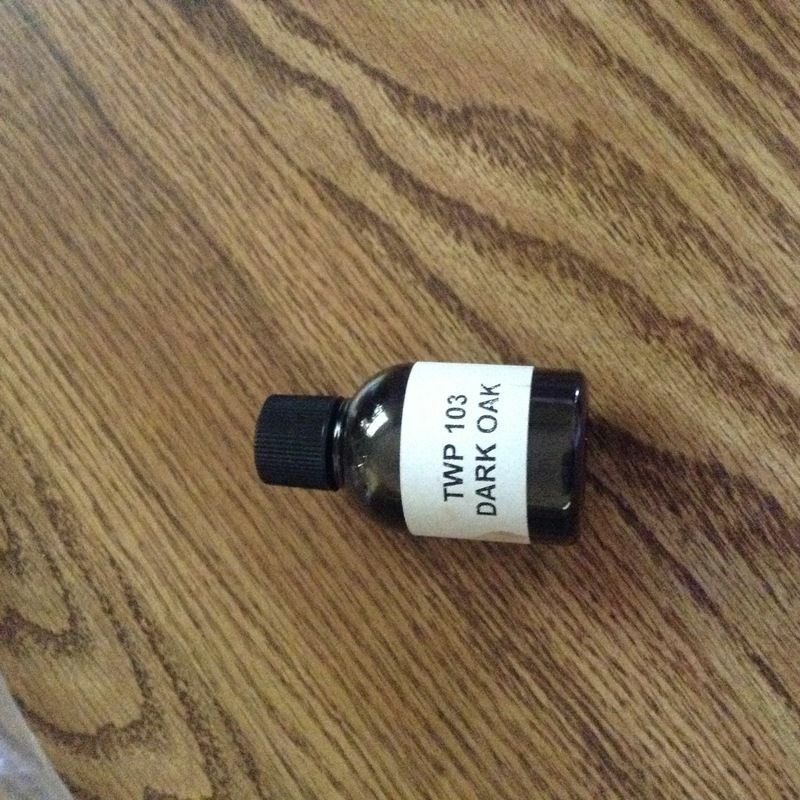 It was applied to a sample of PT Pine wood. Is it possible that the sample I received had the wrong label on it? That is the correct color sample. 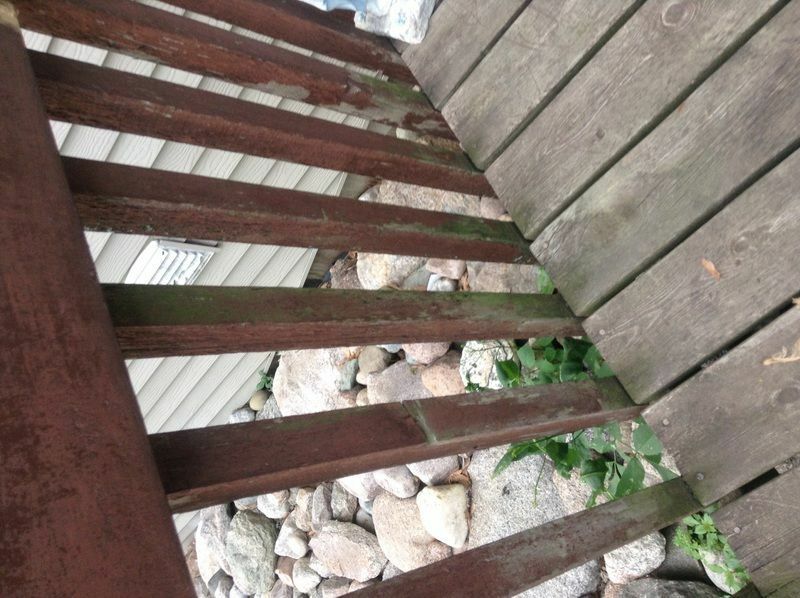 The issue you are seeing it is being applied to unweathered and not properly prepped wood. This will result in much less color absorption. The wood has been laying outside in the weather for at least 3 years. It was cleaned prior to applying stain. The sample is still correct. The issue with less color lies with the wood exposure/prep. 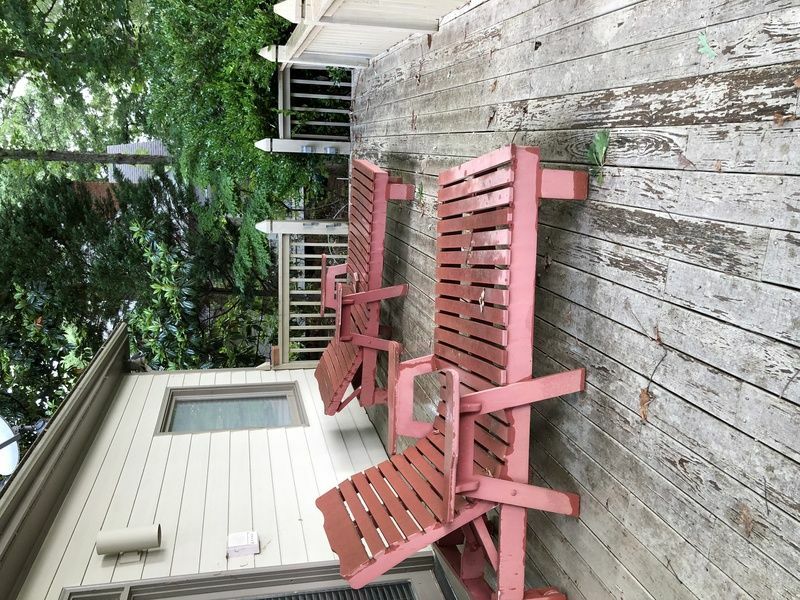 I am looking to re-stain my deck as I just bought a house and it really needs to be stained again. What are the proper preparation steps? Hello, this depends on the brand and type of stain that is currently on the wood now? Feel free to post a picture or two. I have bo idea what is on it but it doesn't look like it's been stained in years so I think sanding it would be just fine. Okay but if you have time, post a picture please. Deck on rear of lake house was painted 10 years ago by former owner. Paint is beginning to peel. 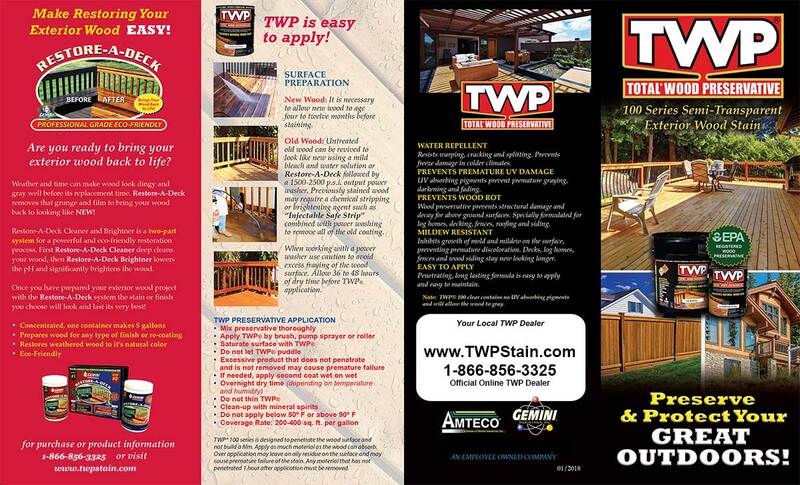 My plan is to pressure wash the deck and then stain with TWP 100. Is the appropriate process or do I need to prep the wood? Adam, pressure washing will not remove the paint fully and it will have to come off if you want to use the TWP. You will pprobablyhave to sand it off after the pressure washing to remove the rest.